This is a hybrid powered unit that uses solar power for day time use, and battery power for night time or low light use. The Smartlite technology automatically illuminates display when the room darkens for easy night time viewing and there is an additional back-light when the light button is pressed. It’s a compact clock measuring just 50 x 105 x 75mm and weighing just 141g it runs of 2 AA batteries when there is insufficient sunlight to power the device. The Smartlite sensor helps to conserve power by turning off the back-light during the day. 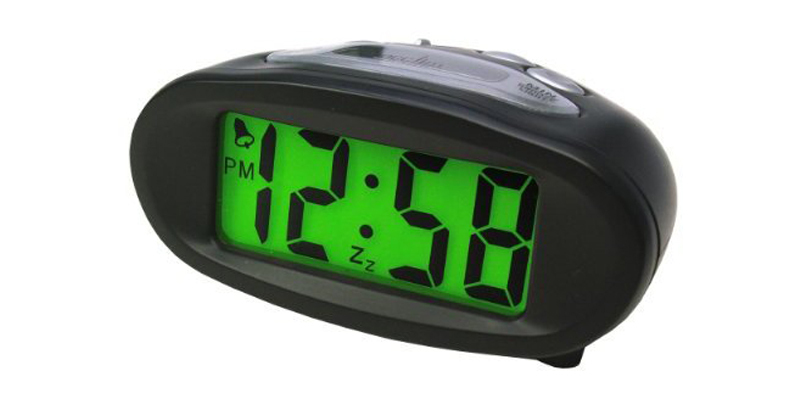 The alarm clock utilises solar power through the day so does not cost anything to run or cause any harm the environment. However at night, when there’s no solar energy around, they use battery power. Excess solar power is used to recharge the AA batteries, so they can last 4 to5 years or more without replacing them, which not only saves on battery costs but also stops further damage to the planets resources. Acctim may not be as well known as some other home electronic brands in the UK, but they are a well established company in this field with a history dating back to 1929, today they are one of the leading brands in the UK clock market and work closely with the major high street shops to develop clock products under the Acctim brand name and also private label projects. The alarm is loud enough to wake even heavy sleepers plus the snooze function offers you another 5 minutes of shut-eye if you need it and unlike many products in this price range – the AA batteries are included in the box. Perfect for travel or holiday use due to lightweight and compact size, but works great on your bedside table at home too!